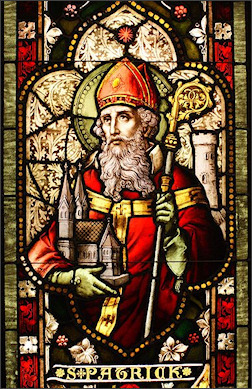 The history of St. Patricks Day owes its origins to the Christian church, celebrating St. Patricks feast day on what was believed to be the anniversary of his death. Way back in 1737, Irish immigrants living in the US began to celebrate this important holiday, and the first St. Patricks Day parade took place in 1766 in New York City. These annual parades soon gained popularity not only with Irish immigrants but other residents of the city as well, and today the St. Patricks Day parade is one of the most popular and most well attended events in the city. These days St. Patricks Day parades are held throughout the country, with Irish and non-Irish residents alike enjoying the comraderie, the festive floats and of course lots of Irish treats. Despite the fun and frivolity of the St. Patricks Day parades and other celebrations, this holiday has its roots deeply embedded in the world of Christianity. Even today, the country of Ireland celebrates St. Patricks Day primarily as a religious holiday. This religious ferver spread even to the famous Irish pubs, and as late as the 1970s all pubs in Ireland were ordered closed on March 17. As time went by, however, the Irish government began to see the tourist opportunities of this uniquely Irish holiday. Beginning in the mid-1990s the Irish government started a campaign to use the holiday to drive tourism to the island, and this strategy has worked very well. Close to one million people visit Ireland each year to celebrate St. Patricks Day where the holiday first got its start. 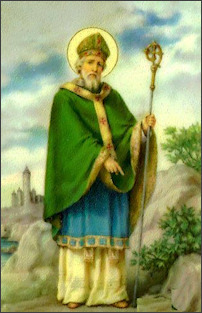 Pious legend credits St. Patrick with banishing snakes from the island, though all evidence suggests that post-glacial Ireland never had snakes; one suggestion is that snakes referred to the serpent symbolism of the Druids of that time and place, as shown for instance on coins minted in Gaul (see Carnutes), or that it could have referred to beliefs such as Pelagianism, symbolised as serpents. Legend also credits St. Patrick with teaching the Irish about the concept of the Trinity by showing people the shamrock, a 3-leaved clover, using it to highlight the Christian belief of 'three divine persons in the one God' (as opposed to the Arian belief that was popular in Patrick's time). Some Irish legends involve the Oilliphéist, the Caoránach, and the Copóg Phádraig. During his evangelising journey back to Ireland from his parent's home at Birdoswald, he is understood to have carried with him an ash wood walking stick or staff. He thrust this stick into the ground wherever he was evangelising and at the place now known as Aspatria (ash of Patrick) the message of the dogma took so long to get through to the people there that the stick had taken root by the time he was ready to move on. The 12th century work Acallam na Senórach tells of Patrick being met by two ancient warriors, Caílte mac Rónáin and Oisín, during his evangelical travels. The two were once members of Fionn mac Cumhaill's warrior band the Fianna, and somehow survived to Patrick's time. They traveled with the saint and told him their stories. The National Museum of Dublin posesses a bell first mentioned, acccording to the Annals of Ulster, in the Book of Cuanu in the year 552. The bell was part of a collection of "relics of Patrick" robbed from his tomb sixty years after his death by Colum Cille to be placed in a shrine. The bell is described as "The Bell of the Testament". The bell is one of three relics described as "precious minna" (extremely valuable items), of which the other two are described as Patrick's goblet and "The Angels Gospel". Cille would seem to be under the direction of an "Angel" for whom he sent the goblet to Down, the bell to Armagh and kept posession of the Angels Gospel for himself. The name Angels Gospel is given to the book because it was supposed that Cille received it from the angels hand. A stir was caused in 1044 when two kings, somehow disputing the bell, went on spates of prisoner taking and cattle theft. The annals make one more apparent reference to the bell when chronicling a death, of 1356, "Solomon Ua Mellain, The Keeper of The Bell of the Testament, protector, rested in Christ." As a mueseum exhibit, the bell is accompanied by a shrine in which it was encased for King Donnel O'Loughlin sometime between 1091 and 1105. The shrine is a sparkling example of fine jewellry. Intricate and delicate Celtic design is worked in gold and silver over every surface except where encrusted with large precious stones. 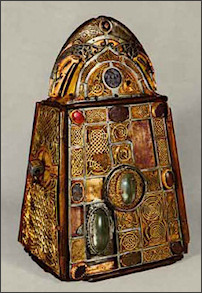 Although today, one or two of the jewels are missing as well as some of the panels of Celtic artwork, full appreciation of the workmanship in the shrine is still possible and it is kept, along with St. Patrick's Bell, in glittering condition by the National Museum as a priceless national treasure. The bell itself is simple in design, hammered into shape with a small handle fixed to the top with rivets. Originally forged from iron, it has since been coated in bronze. The shrine is inscribed with three names, including O'Loughlin's. The rear of the shrine, not intended to be seen, is decorated with crosses while the handle is decorated with, among other work, celtic designs of birds. The bell is accredited with working a miracle in 1044 and having been coated in bronze to shield it from humans eyes for which it would be too holy. Apostle of Ireland, born at Kilpatrick, near Dumbarton, in Scotland, in the year 387; died at Saul, Downpatrick, Ireland, 17 March, 493. Some sources say 460 or 461. In his sixteenth year, Patrick was carried off into captivity by Irish marauders and was sold as a slave to a chieftan named Milchu in Dalriada, a territory of the present county of Antrim in Ireland, where for six years he tended his master's flocks in the valley of the Braid and on the slopes of Slemish, near the modern town of Ballymena. He relates in his "Confessio" that during his captivity while tending the flocks he prayed many times in the day: "the love of God", he added, "and His fear increased in me more and more, and the faith grew in me, and the spirit was roused, so that, in a single day, I have said as many as a hundred prayers, and in the night nearly the same, so that whilst in the woods and on the mountain, even before the dawn, I was roused to prayer and felt no hurt from it, whether there was snow or ice or rain; nor was there any slothfulness in me, such as I see now, because the spirit was then fervent within me. " March 17, popularly known as St. Patrick's Day, is believed to be his death date and is the date celebrated as his feast day. The day became a feast day in the universal church due to the influence of the Waterford-born Franciscan scholar Luke Wadding, as a member of the commission for the reform of the Breviary in the early part of the 17th century. St. Patrick is also venerated in the Orthodox Church, especially among English-speaking Orthodox Christians living in the United Kingdom and the Republic of Ireland and in North America. There are Orthodox icons dedicated to him.